The City of Baltimore has long been home to one of the East Coast’s most vital maritime ports. Located 40 miles from the nation’s capital, the Port of Baltimore handles 11 million tons of cargo every year, including break-bulk, containers, and automobiles. In addition to its role as a driving economic force for the region, the Port is also a major tourist attraction, with Baltimore’s Inner Harbor welcoming millions of tourists each year. To celebrate the region’s rich maritime heritage, and its role in defending the nation, Baltimore recently held the 2018 Maryland Fleet week and Air Show from October 5th-8th. Over a dozen U.S, Canadian, and British warships provided guided tours and demonstrations to thousands of residents. For employees of Sauer Compressors USA, the leading manufacturer of high-pressure air compressors to the U.S. Navy and its component commands, this year’s Fleet Week provided an opportunity to visit its compressors in the fleet—a Mistral Series WP22L compressor used on Military Sealift Command’s newest expeditionary fast transport (EPF) ship, the USNS City of Bismarck (T-EPF-9). Like its sister Spearhead-class ships, the Bismarck provides rapid intra-theater transport of military equipment and personnel. With its aluminum, twin-hull catamaran shell, and four powerful MTU 20V8000 M71L diesel engines the ship can reach speeds between 35-45 knots, while carrying company-sized Marine Corps units and vehicles for naval re-supply, drug interdiction and humanitarian assistance operations. Image 1: The USNS City of Bismarck (T-EPF-9) visited the Port of Baltimore during Fleet Week 2018, providing Sauer USA employees a unique chance to see a Sauer compressor onboard a Naval ship so close to its headquarters in Stevensville, MD. 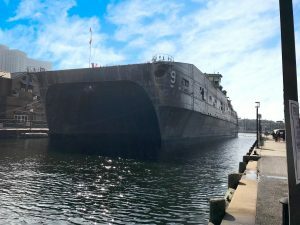 The USNS Bismarck requires a shallow draft (less than 15’) while carrying a payload of up to 600 tons of equipment and personnel at a range of 1,200 nautical miles. To carry out its mission one of the most important factors in selecting propulsion equipment is weight. In particular, ship designers required a compressor to provide ship’s starting air for the four diesel engines with a relatively light-weight and compact configuration. For this integral role, Military Sealift Command selected Sauer Compressors’ Mistral Series WP22L compressor. Both compressors provide ship’s starting air by filling high-pressure air receivers rapidly. Like most Sauer Compressor models, the WP22L is designed to operate in the harshest Navy environments. The WP22L meets all MILSPEC ratings for use on U.S. Navy vessels. Headquartered in Stevensville, MD, just 35 miles from Baltimore on Kent Island in the Chesapeake Bay, Sauer Compressors USA, Inc. is the primary supplier of high and medium-pressure air and gas compressors for the U.S. Navy and the U.S. Coast Guard. With compressor packages on the Navy’s aircraft carriers, amphibious transports, guided missile frigates, destroyers, littoral combat ships, and submarines, our compressors are deployed around the globe. Image 2: One of two WP22L compressors built for the USNS Bismarck at Sauer Compressors USA’s factory just prior to shipping to Military Sealift Command in September 2014. For Military Sealift Command’s Spearhead-class T-EPF program, Sauer USA designed, built, and maintains each WP22L compressor package. 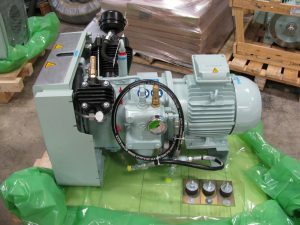 These two-stage, air-cooled compressors are rated for 24/7 continuous duty, using direct-drive (no belt maintenance) for optimum efficiency and lower maintenance intervals. Sauer Compressors USA Inc. specializes in the manufacturing of medium and high-pressure air and gas compressors for naval, commercial maritime, offshore, research & development, and demanding industrial applications. In addition to air, Sauer Compressors is saturated in the CNG, N2, He, and inert gas markets. Sauer USA, located in Stevensville, MD manufactures high-pressure compressors rated for continuous duty, all compressors have been field tested in the most demanding applications and extensively refined to provide true 24/7. With a reputation for reliability and life cycle product support, Sauer Compressors is the global leader in the medium and high-pressure compressor markets. Copyright © Sauer USA . All Rights Reserved.